Read Deborah’s story in RISE Online here. Deborah Robertson is an Australian singer/songwriter who has made a name for herself as a blues and jazz singer. Her album “Have I Got News For You” (Newmarket Music) is on playlists on airlines all around the world. But her recent EP brings Deborah back to a very personal place of reflection as she shares her most heartfelt experiences through song. Deborah wrote all four songs on the EP ‘All Praise to you Lord’, which takes the listener through a progressive journey from loss and brokenness, to healing and hope, to restoration, and finally to joy. Beautiful guitar work is provided by Steve Prince (He’s Being Your Mum) and Sam Leman (Jesus Can Heal your Life, All Praise to You Lord and Jump for Joy). He’s Being Your Mum recounts the heartbreak of Deborah’s loss through miscarriage and her struggle in coming to terms with that loss. She is honest about her struggle but eventually finds comfort in the knowledge that her babies are being held and cared for by their Heavenly Father. I confess that I can’t listen to this song without shedding a tear, as I remember the blessing it was to be able hold my babies ‘so close our cheeks would melt’. Jesus Can Heal Your Life opens with the words ‘don’t you worry, don’t you cry’ as Deborah brings words of comfort and hope to others who, like her, have experienced grief, anxiety and pain. All Praise to You Lord shifts into a more bluesy feel as Deborah thanks God for what he has done in her life ‘holding my hand through the eye of the storm’. Her gentle testimony that God has restored her from her broken state and ‘made me new’ evokes a sense of peace. The song points to transformation. Jump for Joy is, as the title suggests, a joyful response to God as she reflects that he never let her go when she had ‘sunk down way too low’. I love the way Deborah has woven into this beautiful, uplifting song a reference to the spiritual armour that we are called to put on each day. You will want to sing, clap your hands and tap your feet to this one. Each song brings the artist’s versatility to the fore as she sings in the different styles of country/folk, gospel, blues, jazz. While her voice has a different quality, I am reminded of Eva Cassidy when I listen to this EP because, like Eva, Deborah seems determined not to be pinned down to just one genre. During each song, I had the same thought: ‘I like this one better than the last.’ This EP is smooth, easy, melodic in a musical sense, but don’t be deceived. Deborah speaks from the deep broken places of her heart and you will be stirred by her very personal stories. I highly recommend you give this EP a listen to, and I look forward to hearing more from Deborah in the future. 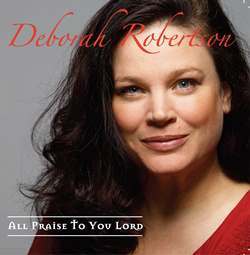 To purchase or listen to samples of ‘All Praise to You Lord’ go to www.deborahrobertsonsinger.com.